Over the years, I’ve heard several professor friends announce that they teach for free and get paid to grade. We all have our professional strengths and interests, but I’ve never met someone who actually likes grading. Grading final papers, tests, and projects at the end of the fall semester feels easy enough: cozy up under a blanket, sip some tea, eat some holiday cookies and crank through the pile of work. Spring is a different experience. With the smell of flowers and freedom in the air, grading can feel never-ending. We often just want to get our summers started, so we can turn back to our research, plant our garden, exercise more, get a haircut, maybe see some friends. I was struggling to make good progress on 56 literature reviews last week–and it made me grumpy. Whenever I recognize that I’m feeling grumpy for a few days in a row, I think about what I can change about my behaviors to take better control of the situation. In graduate school, a grumpy episode led me to Julie Morgenstern’s Time Management from the Inside Out. 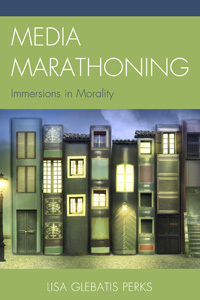 It’s a great book for academics and other folks who need help structuring their time better. Morgenstern says to approach time management like you would a financial budget: start with how much money/time is available before you start deciding how much money/time you can spend. After reading her book, I started crafting to-do lists with time estimates on them and comparing that list to the time I had in my work day day. The practice helps prevent the construction of an overly-ambitious to-do list that will never get finished and makes me feel bad about my progress. 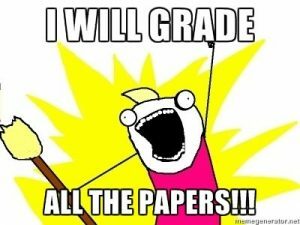 One Hour On: Grade for about an hour–however many papers/tests/projects that is for you. I can usually do 4 short (5 page-ish) papers in that time. I would never recommend stopping in the middle of grading one piece, so use a little bit more or a little bit less than an hour as needed. Fifteen Minutes Off: Take a 15-minute break, ideally doing nothing involving screens or reading. I would take brief walks, water plants, wash dishes, stretch, eat a snack, etc. Repeat up to 5x: Repeat the hour on/15 minutes off up to a total of 5 times throughout your day. I found that 5 hours of intense grading is my maximum in terms of really paying attention to what I was reading. Long Break: Ideally, you should break up the 5 repeats with a longer activity in the middle and a change of scenery. For example, I did a spurt of grading (2 repeats) in my gym’s cafe before I worked out. After having lunch and showering, I settled in for 3 more repeats at home. Type Paper Comments: Grade on the computer if you type faster than you write by hand. I started grading through Blackboard or Moodle about 5 years ago, and it’s a lot quicker for me. Conference on Rough Drafts: Conferencing with students on rough drafts of their papers not only yields better quality papers, but it also makes the final grading quicker because I’m more familiar with their work. I also had students write revision letters with their final drafts so I could see a list of the changes they made and be on the lookout for those changes. Use a True Rubric: A true rubric is not a list of grading categories and point values; it describes the characteristics of particular assignment components at different grade levels (e.g., an “A” level organizational structure will demonstrate x, y, and z). This Carnegie Mellon University Teaching Excellence page describes what a rubric is, notes many advantages to using rubrics, and offers several samples from different disciplines. I’ve found that rubrics clarify the paper expectations for students. (I use them in addition to a detailed assignment guide.) Rubrics also keep me from repeating the same comments on every paper to justify the grade. I make comments in the student paper in Blackboard, highlight the relevant sections in the rubric, upload the rubric in Blackboard, and I’m done. My family vacation starts at the end of June, just as I’ll receive another round of final papers. With this new system, I’m confident that I’ll get done with grading and back to the beach quickly. Hopefully these suggestions will help some fellow teachers spend more time enjoying themselves and less time fretting over grading. I’d love to hear other strategies that work for you in the comments below.